Hello, Happy Halloween! 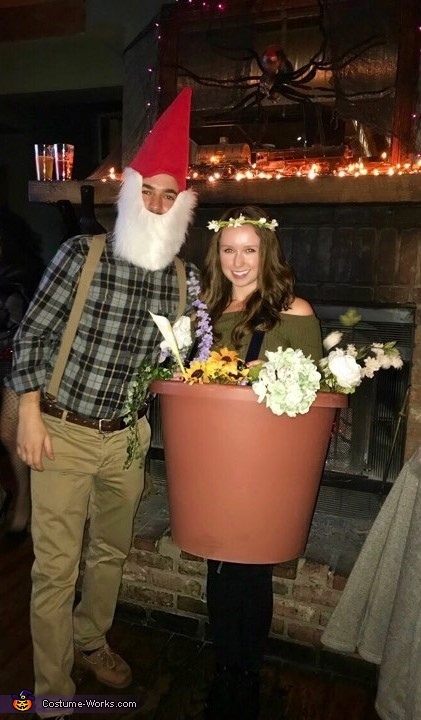 Our Flower Pot and Gnome costume idea I discovered on Pinterest, but decided to re-create due to my love of gardening and the unique-ness of it, I hadn't seen this costume idea before! Bonus that my boyfriend could remain in his normal clothes and have a minimal costume this year! And the gnome puns are too clever. My boyfriend and my dog are sporting the gnome hats I made them! Which is simply made out of thin foam and red fleece I had on hand. I rolled them into a cone shape and hot glued into place. Then I cut a piece of white fur I found at the craft store to the desired beard shape and safety pinned the fur to the hat to hang loose. My boyfriend was able to wear his regular clothes - i.e. tan pants and a flannel, but I added suspenders. My dog's “flandana” is also fabric I picked out & cut to shape. My flower pot is a real large plastic one, thanks to a landscaper friend of ours, with the bottom sawed off; and fake flowers are stuck to the inside using floral foam with suspender straps for me to wear like a dress. Before I even walked through the doors at the party, I received some compliments! Strangers were telling me how cute of an idea it is and that they are going to take the idea for their own next year! They asked me how I made it and where I got my flower pot exclaiming how easy it would be to do!